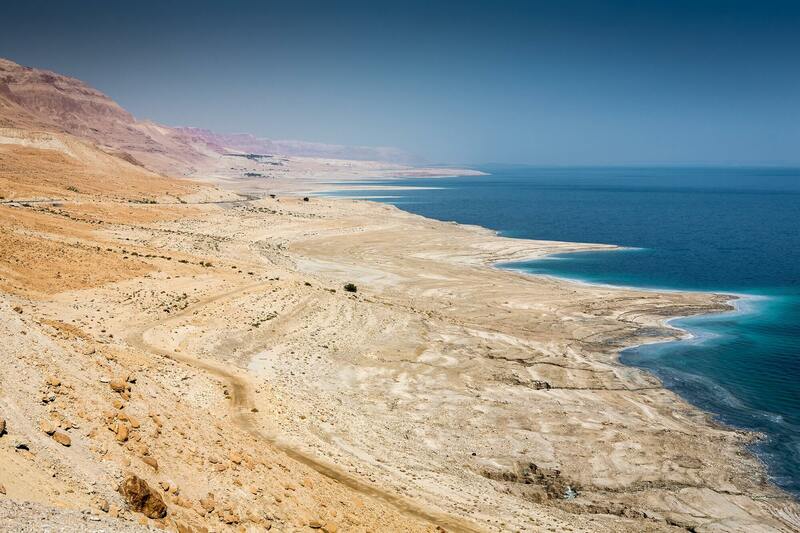 The Dead Sea (Hebrew: יָם הַמֶּלַח‎ Yam ha-Melah lit. Salt Sea, Arabic: البحر الميت‎‎ Al-Bahr al-Mayyit), is a salt lake bordered by Jordan to the east and Israel and Palestine to the west. Its surface and shores are 430.5 metres (1,412 ft) below sea level, Earth's lowest elevation on land. The Dead Sea is 304 m (997 ft) deep, the deepest hypersaline lake in the world. With 34.2% salinity (in 2011), it is 9.6 times as salty as the ocean, and one of the world's saltiest bodies of water. This salinity makes for a harsh environment in which plants and animals cannot flourish, hence its name. The Dead Sea is 50 kilometres (31 mi) long and 15 kilometres (9 mi) wide at its widest point. It lies in the Jordan Rift Valley and its main tributary is the Jordan River. The Dead Sea has attracted visitors from around the Mediterranean basin for thousands of years. It was one of the world's first health resorts (for Herod the Great), and it has been the supplier of a wide variety of products, from asphalt for Egyptian mummification to potash for fertilizers. People also use the salt and the minerals from the Dead Sea to create cosmetics and herbal sachets. The Dead Sea water has a density of 1.24 kg/litre, which makes swimming similar to floating.